Hershey’s new “Fresh From The Factory” candies are shipped to you within 96 hours of them being made at the Hershey’s factory so you get them at their freshest. About two weeks ago I reviewed Hershey’s new Fresh From The Factory (FFTF from now on) Reese’s Peanut Butter Cups and I wasn’t overly thrilled with them. They are good but not that much better than the original. I suspected though, that FFTF Twizzlers would be better than the original by leaps and bounds. I was right. I’ve never really liked Twizzlers much. I am more of a Red Vines man. I always thought eating Twizzlers was like gnawing on a rubber hose – very chewy and mostly tasteless. My wife, however, loves Twizzlers and has for years. I know, how can a Twizzlers-lover and a Red Vines man live in the same household? 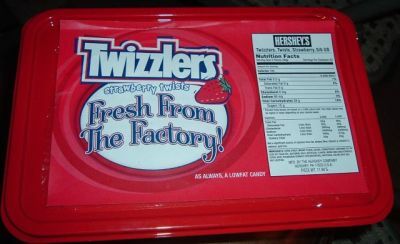 I received a 5 lb tub of FFTF Twizzlers and aside from the great smell, the first thing I noticed is how soft they were. To best illustrate how soft and fresh they are, I took the pictures below. I went out and bought a pack of non-FFTF Twizzlers at a local store to use for comparison. I balanced one on my finger. Notice how it stays almost completely straight and just barely bends. 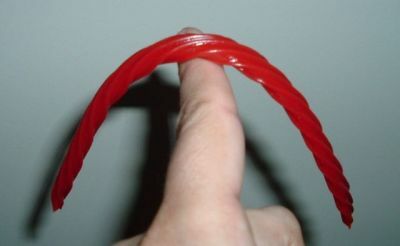 Now take a look at a FFTF Twizzlers – notice how much it bends. It is so soft and fresh that it bends so that both ends are pointing in the same direction – down. Now that’s fresh! Notice also that the fresh Twizzlers are much lighter in color. Do Twizzlers darken with age? it would seem so. The difference in taste between FFTF Twizzlers and regular store-bought Twizzlers is like night and day. The FFTF Twizzlers are soft and good and have loads of flavor. I have been munching on them since I got them. If you don’t like Twizzlers, these could make you change your mind. If you do like (or love) Twizzlers, these could make you not want to go back to the store-bought kind. They are that good and that different. Just like the FFTF Reese’s, the Twizzlers are only available during limited windows, so if you want to try them, I suggest ordering if you see them available. A 5lb tub of FFTF Twizzlers will set you back $20 plus shipping. As of this writing, the window is open. RESPONSE: Twizzlers come in black, but I don\’t think they are offering FFTF black Twizzlers. Really? here’s the link to FFTF Black Twizzlers! Yay, we have a box of Twizzlers on the way! We ordered some for fathers day, except they’ll be coming a couple days late…but its still worth it! Hahaha Thanks! I just remeber because my Dad couldn’t decide weither he wanted Black, or Red Twizzlers…we went with the red! I am from Lancaster, PA… where the Y & S factory is located. Funny enough, its also where the Kunzler hot dog factory is located (not in the same building). Depending on the direction of the wind on any given night downtown, one will smell the faint sweet smell of Twizzlers or the not so sweet smell of Kunzler hot dogs. I am not kidding. There really is nothing finer than fresh Twizzlers. The only problem with this is that I\’m one of those people who prefer my Twizzlers as hard as possible. You know, open the package, stick it in a cabinet, eat it in a few weeks. Just like with Peeps. Hi Brian, I tried going on the web site to order a tub of twizzlers (fresh from the factory), but I cannot see how to order. Could you please tell me what to look at? We need more Twizzlers to find more candy! I bought a bag of twizzler candy coated bits in Big Lots. I never aw these again and I loved them. Does anyone know where to get some. They were somewhat like Good and Plenty. I am also a stale Twizzler Lover, but I do appreciate the info. Thanks! I just got these today in the mail! and they were a surprise! I am a nanny.. and the family knows i love Twizzlers… i got home today and the box was sittng by the door! I swear im in Twizzler heaven! They are so good! BEST BIRTHDAY GIFT EVER!! I love licorice….I am going to pick up some Twizzlers on my way home today. Can anyone help me find a website that will sell me the fun size twizzlers, I simply CANNOT WAIT FOR HALLOWEEN! !